DIE Mercurii, 14 die Novembris. Report concerning Foreign Nobility. Precedency. King to be addressed, in relation to Precedency of Peerage of England. Bp. Hereford to preach at the Thanksgiving. Hodie 2a vice lecta est Billa, "An Act for confirming of Enclosures made by Decrees in Courts of Equity." Their Lordships, or any Five; to meet on Saturday next, at Three of the Clock in the Afternoon, in the Prince's Lodgings. Their Lordships, or any Five; to meet on Saturday next, at Three of the Clock, in the Prince's Lodgings. ORDERED, That on Friday Morning next this House will proceed in the Report of the Bill against importing of Irish Cattle. 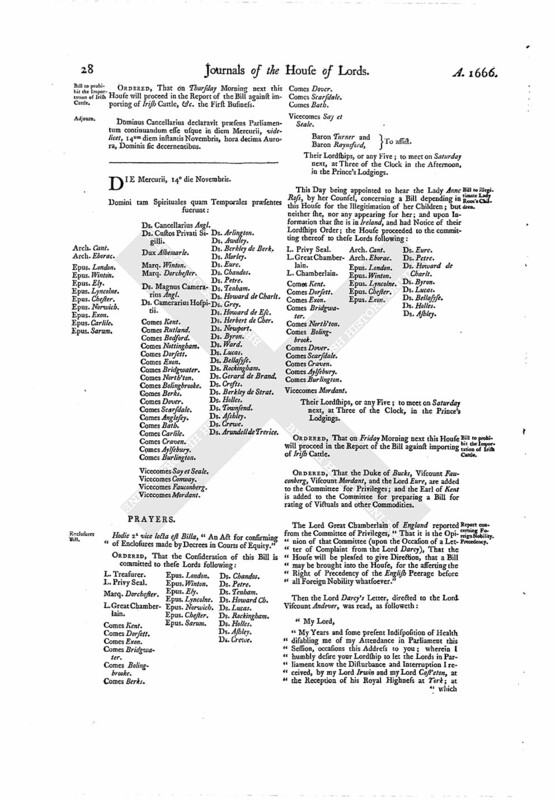 ORDERED, That the Duke of Bucks, Viscount Fauconberg, Viscount Mordant, and the Lord Eure, are added to the Committee for Privileges; and the Earl of Kent is added to the Committee for preparing a Bill for rating of Victuals and other Commodities. The Lord Great Chamberlain of England reported from the Committee of Privileges, "That it is the Opinion of that Committee (upon the Occasion of a Letter of Complaint from the Lord Darcy), That the House will be pleased to give Direction, that a Bill may be brought into the House, for the asserting the Right of Precedency of the English Peerage before all Foreign Nobility whatsoever." Hornby Castle, 20th of October, 1666. After this, the Lord Viscount Fauconberg gave the House an Account of the Truth of the Matter of Fact as is expressed in the abovesaid Letter, he being present at the same Time. Hereupon the House, upon Consideration of this Report, were of Opinion, To make an Address to His Majesty, He being the Fountain of Honour. 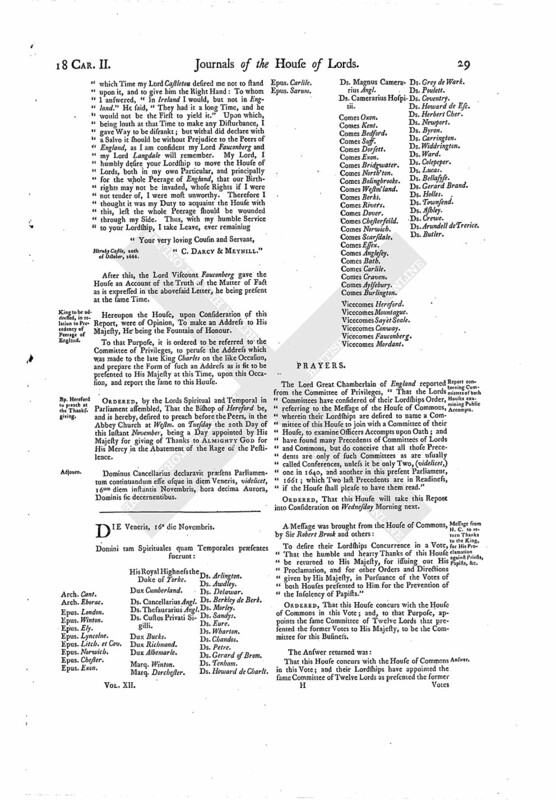 To that Purpose, it is ordered to be referred to the Committee of Privileges, to peruse the Address which was made to the late King Charles on the like Occasion, and prepare the Form of such an Address as is fit to be presented to His Majesty at this Time, upon this Occasion, and report the same to this House. ORDERED, by the Lords Spiritual and Temporal in Parliament assembled, That the Bishop of Hereford be, and is hereby, desired to preach before the Peers, in the Abbey Church at Westm. on Tuesday the 20th Day of this Instant November, being a Day appointed by His Majesty for giving of Thanks to Almighty God for His Mercy in the Abatement of the Rage of the Pestilence. Dominus Cancellarius declaravit præsens Parliamentum continuandum esse usque in diem Veneris, videlicet, 16um diem instantis Novembris, hora decima Aurora, Dominis sic decernentibus.